If you plan to drive in colder climates having the proper tire ensures you have the best traction in tough conditions. While there are many snow tires available, it’s important you look for some that have innovative features that can provide you better control on slick surfaces. Here is a list of the best snow tires. 1. Tire Rack’s website recommends the Dunlop Graspic DS-3, as they are the best tires for snow. One of the best features of these is the premium tread compounding, which provides superior traction for drivers in inclement conditions. 2. Nokian snow tires are some of the best you can buy. These tires have been tested in some of the toughest conditions on earth, which means they will provide you durability in even the most difficult conditions. 3. The Michelin Pilot Alpin PA3 Tires are some of the best tires for snow. The reason for this is due to their asymmetrical tread design that provides excellent control and stability for the driver. 4. Another favorite for drivers is the Michelin X-Ice Xi2 Winter Tires. These tires are designed to endure the harshest surfaces as the high silica tread compound provides better traction in slick environments. 5. The versatility of the Nokian WR G2 All-Weather Plus is a huge draw for drivers. While you’ll receive the best performance from these in the winter, you can leave them on year-round as they will provide excellent stability for drivers on a variety of surfaces. 6. 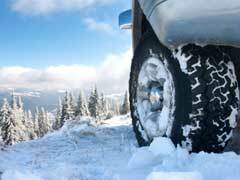 For SUV drivers, you’ll want to find the best tires for snow that give you exceptional handling in tough conditions. One of the best tires for SUV is the Goodyear UltraGrip SUV Tire- 265/65R17 112T SL. They have enhanced traction, which will provide you excellent control in harsh conditions. 7. The Pirelli Scorpion Ice & Snow is another great tire for crossover and SUV drivers. The rubber tread compound gives the tires its flexibility thereby providing better control for drivers. 8. One of the more affordable options is Firestone’s Winterforce 215/70 R15 98S. One of the tires best features is there are thousands of edges on the side, which grip the road. This in turns makes handling much easier for drivers in snowy conditions. 9. The Achilles Winter 101 155/70 r13 75t BSW Winter/Snow Tires are a good option for drivers looking for cheap but durable tires. The treads provide better traction on slick surfaces that can help you maintain stability. 10. Goodyear snow tires are one of the best brands as they combine innovation and performance. The Goodyear Eagle Ultra Grip GW3 Tire has V-TRED technology, which removes water and slush away from the contact patch thereby providing excellent control for drivers. You can find these models at many auto body shops and online retailers like Tire Rack. Along with these best tires for snow, you can find many wheel and tire packages.